Imagine an old wooden desk, small file cabinet, a black rotary phone and a small wood stove to keep warm on those cold wintery nights in this historic building. But before the "World's Smallest Police Station" became a police station in 1940, it was the town well. The area behind the police station is known as the cotton yard. It's called this because it was used as a staging area for cotton farmers bringing their cotton into town to be loaded on the train for shipment. Before farmers would leave town, they would pull their wagons up to the well to water their mules and oxen. Some residents can remember when cotton farmers were lined up from the cotton gin, located in the building behind Ruff Hardware, south on Palmer Street over the railroad bridge. 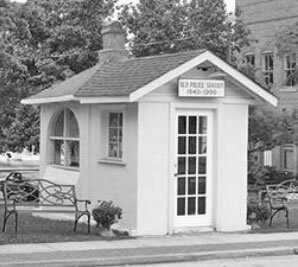 In 1940, as part of the old WPA project, the well was covered up and the "World's Smallest Police Station" was born and served several officers until 1990 when the current police station opened up. The "new" station was formerly the Town's garage and housed a tractor and equipment for Ridgeway's Water and Sewer Department. Before that, the building was Ridgeway's fire station housing one truck. After remodeling and renovation, you can see that the Police Department has doubled in size. The old police station has had its share of the spotlight in the last several years. You might have seen it in the 1989 film "Staying Together", starring Stockard Channing, Sean Alston, Tim Quill, and Daphne Zuniga which was filmed in Ridgeway. On June 25, 2006 it was host to the world as the Centennial Olympic Torch Relay made an official rest stop in front of the "World's Smallest Police Station". The following is a list of former police officers who have worked out of the old police station. The list was compiled by memory from some of Ridgeway's residents. Every effort was made to include everyone who called the police station "home".